Creating a vision for the Welder of what his/her world and job will look like, is one of the central aims of our e-zine, The WelderDestiny Compass. In this web page we tentatively describe what the future professional world will look like for the Welder. This will enable anybody entering the welding industry, particularly Welders, to anticipate the types of skills and knowledge that will be required to meet the future with confidence. This web page is essentially a compendium of articles published in The WelderDestiny Compass that deals with the vision for the welder. It assists those that want to follow our discussion regarding this future vision for the Welder without having to actually read all the back issues of The WelderDestiny Compass. It will be updated every time we add to our future vision for the Welder and his/her world. 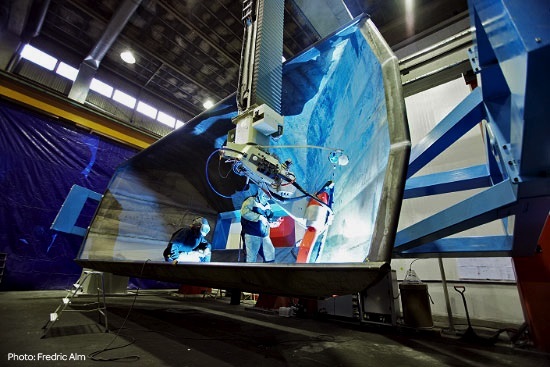 A Robotic Welder: This robotic welder is designed for manufacturing rail wagons for transporting iron ore. - Acknowledgement to Frederic Alm and Kiruna Wagon for the image. As you read the compendium of the "vision for the welder" articles within this page, please keep in mind that these articles also have reference to other articles within the same e-zine edition in which they were originally published. This may make the different articles below appear a little disjointed. If you would like to see the broader context of any specific article, please click through to the full e-zine to get a more complete picture. There are many drivers that encourage people to move to the casual employment model. Some of these drivers are associated with legislative barriers, such as labour laws, that make it more advantageous for companies to hire people on a casual basis than on a permanent basis. Some of the drivers are associated with the need for companies to be very responsive and able to “right size” at very short notice due to the rapidly changing economic landscape. Some of the drivers are associated with personal preference issues. Some people just like to have the flexibility to “do their own thing” when needed. Once this trend runs as far as it can, the situation will arise where most employment is out-sourced and employment relationships become casual. The main function of the traditional employers will be to manage their “one-man contractors", not their employees. Welders are not new to temporary or contract based employment. In fact, it has been around for a relatively long time. One of the reasons that welding is well suited to this working model is that it is a skill based job. A skilled welder can very quickly become productive when moving between employers. The ways of working are relatively standard between different employers, and the processes and equipment are also relatively standard. Having said this, there are major concerns and opportunities within the welding industry to streamline this process. These are opportunities for adding value and ensuring quality outcomes by matching the Welder with a specific set of skills and experience with the right welding jobs. Let us imagine a world where we integrate the ideas regarding the commoditisation of engineering, the use of artificial intelligence and the “privatisation” of employment. In such a world, we start seeing that every Welder is in effect a one-man business. What opportunities are presented by a need for Welders to manage all their own systems? In this future reality, you as a Welder may need to have the tools, systems and the ability to not only perform the welding, but also the control functions such as quality assurance and quality control (QA/QC) around the welding operation. The Welder of the future will in all probability be a one-man welding solutions provider to companies that want to only worry about the project management functions, not the technical details. Can you see the steps that you need to start taking to prepare yourself for this future? We will certainly expand on these ideas in future editions of The WelderDestiny Compass. The most obvious introduction of augmented reality (AR) within welding is in the training environment. Imagine the savings and safety improvements possible if most engineering students can be taught to weld within a virtual environment. There are already a number of providers of AR systems within the Welder training space. One of these is the ARC+ welding simulator. I have not actually used this system, so this mention should not be seen as an endorsement, but if you are interested in this kind of thing, their website will be a good place to start. Another obvious application of virtual reality in welding is the simulation of jobs that may have very restrictive access conditions. A model of the job can be created on a 3D modelling software platform, and then the output from this model can be used to create the virtual environment for the welder to simulate the welding job. Previously we have considered how additional sensors will be integrated into the welding set-up to gather additional quality control data. Another very exciting possibility of the AR technology, is to integrate the welding sensor data into a real-time visual feedback to the welder. As an example of how this could work, let us surmise that an infrared (IR) camera is monitoring the weld during the welding process. If porosity is introduced into the weld, it will have a different temperature to the rest of the weld metal. The computer monitoring the IR video feed (based on artificial intelligence) will detect this difference in temperature and highlight it in a different colour within the Welder's video feed of the weld. Let us say with a blue spot. While the temperature anomaly associated with the porosity will be transient (probably gone within a second or less) the computer will continue to show the porosity as a permanently different coloured spot on the weld. The welder can then stop welding and return to perform the grinding necessary to remove the porosity. Note how this could very easily be integrated into a welding helmet that uses two stereo cameras to show us what we are looking at, rather than a darkened glass. Once we have welding helmets working on this principle, we can integrate almost any application and additional data into the Welder's field of view. When you break the arc, the screens will automatically lighten to show you an undarkened view of your surroundings. This is similar to the auto-darkening helmets of today, but based on a technology that will enable huge integration with any relevant data technology. You, the Welder, will have constant feedback within your welding helmet of all the relevant welding parameters (volts, amps, travel speeds, heat input etc. will be displayed like with a head-up display in a fighter jet) overlayed with any additional sensor feedback that is monitoring QC functions. If you think this is so far in the future that it is not worth worrying about, then I believe you are wrong. Strictly speaking, all the technology I have described is already available. It is just not portable enough to be practical. All that is needed is for this to become cheap enough for it to become freely available. My guess... I give it 5 years. Within 10 years, I think this type of functionality will become relatively commonplace. Are you one of the Welders excited to embrace this technology, or are you afraid of how it will shake your world? Remember... For salvation, we need to move beyond fear. Within decentralised manufacturing facilities, most welding will be done by the robots in any case, so that does not change much from the current manufacturing model. What does change is that such fabrication facilities will invariably need support services. Part of those support services will be welding related. As the advantages of being close to your customer base starts to override the cost advantages of having global scale manufacturing facilities, such decentralized manufacturing facilities should mushroom all over the world where the necessary infrastructure and customer base exist. While we have used the automobile industry as an example, it will probably be one of the last industries to decentralize. Earlier adopters would probably be industries associated with appliance manufacturing, plumbing supplies, recreational items, toys etc. On a local basis, the amount of support services for such manufacturing cells will greatly expand. The services we are looking at would be services that would be too costly to incorporate into the manufacturing cell itself, or for maintenance of the manufacturing cells. Trades associated with "hardware" and maintenance would in all probability experience an increase in workload rather than a reduction in workload under such an economic model. In short, introducing robots into manufacturing has the potential to not only decentralize manufacturing, but also decentralize the support functions. This may lead to increased demand for artisan services with the right knowledge and skills. Most probably on a "contracted-in" basis. Be one of the Welders with the right knowledge and skills before the trend becomes obvious! Getting back to Neil Le Quesne's article, he gives quite a lot of data regarding the projected shortages of experienced welders in the near future. Neil quotes a statistic that there will be a shortage of 400 000 welders in the USA by 2024. Obviously this number is based on a whole lot of assumptions which may or may not play out. None-the-less, the principle is sound. It is not possible to grasp experienced welders out of thin air. Neil's answer is higher productivity and automation. In particular Neil is drawing attention to the great gains possible with K-TIG welding, but the principle is universal. There are many ways to improve productivity. I agree that these will be the answers to any manpower shortage, but they will naturally flow from the economic realities. Supply and demand dynamics will ensure that Welder pay rates will increase if there is a shortage of Welders. With the increase in Welder rates, more jobs will "qualify" for automation. The cost of capital to invest in robots and automated systems. The cost of Welder hours. It is not possible for anybody to give a clear timeline for how these things will play out. Despite this uncertainty, what is clear is that if you as a Welder can gain the skills, knowledge and experience that increases your productivity and ability to fit into many different niches, you will be at the top of the list when work is being handed out. In this regard, there is a critical question to ask yourself: Do I have 10 years' experience, or 1 year's experience ten times over? What are you doing to make sure that you are at the top of that list?